Danielle is the Projects and Event Planning Department Administrative Assistant (PEP Department). Danielle provides administrative support to the PEP team. She works on projects including the quarterly printed newsletters and helps with the planning and preparation for the Academy’s Spring and Fall Summits. As for internal events, Danielle provides her support during office celebrations and company retreats. 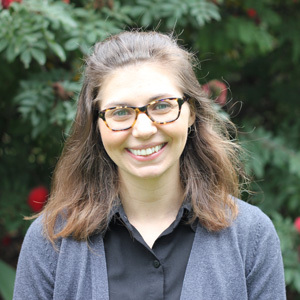 Danielle has 7 years of administrative experience in higher education, including financial aid support for undergraduates at Allegheny College and coordinating projects through the Office of the Provost at Carnegie Mellon University. She studied psychology and creative writing at Allegheny College where she earned her Bachelor of Science degree. Born and raised in Saegertown, Pennsylvania, Danielle now lives in San Diego, where she attends the University of San Diego to complete her Master’s degree in Clinical Mental Health Counseling. When she has time to take a break from her studies, Danielle is a hiking enthusiast, amateur chef, and a music fanatic.